I read the above verse earlier this week, and something has been sticking out at me all week, so I decided to write it down. It’s the fact that Judas, the betrayer, who walked with Jesus, took a morsel from Jesus right before he allowed Satan to enter him. And he did not stick around to for the Institution of the Eucharist. Here was a man, who was with Jesus, saw Him perform miracles, and heard him preach. Christ identifies Judas, his betrayer, to “the Apostle whom He loved” as the one who would betray Him by handing him a morsel. Once Judas has accepted the morsel, he allows Satan to enter him. I often think that if I were alive back then, surely I would KNOW Jesus, surely I would recognize Him, surely I would see how He was teaching us to Love. 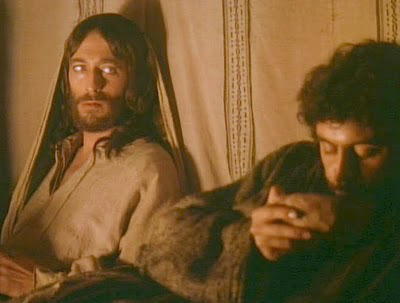 But then there is Judas, and it always baffles me, how could he have betrayed his friend like that? But I got to thinking, we can KNOW Jesus today, by speaking with Him intimately. But there are so many of us who don’t. There are so many of us who take a morsel of His teaching and yet still let Satan influence. I think the bible refers to it as being lukewarm. It is when we use Jesus as a convenience for ourselves and toss Him aside when it doesn’t work for us. Rare is the soul who gives all to Christ. I struggle with this myself. I know we are all sinners, but we are called to “be perfect as your Heavenly Father is perfect (Mt 5:48)” It is walking in complete and total trust, being merciful to others, and constantly examining our own conscience. I have written about it many times. But, it IS what we are called to do. Christ gave all for us, and Instituted the Eucharist so His Body, Blood, Soul and Divinity is present with us each day at Mass. Yet many of us reject this once we walk outside, or skip Mass, as if we have no idea that Heaven on Earth is taking place there each day. We take only the morsel that works for us, and then we go and live out life as if we don’t know Jesus at all. Here, this little way of St. Therese makes her a giant for God. She has captured what Judas failed to see. And really what so many of us fail to see. We have this ability to chalk Jesus up to some nice guy, who was simply nice to other people. But, Jesus wasn’t crucified for being nice. He was changing lives in a RADICAL way. He wasn’t a passive nice guy, but He wasn’t violent either. He was a radical lover of human beings, each individual one of us. And they killed Him for it. And Judas, seeing the coming persecution chose to betray. He chose what he thought was the path to less earthly suffering, and chose evil over that perceived suffering. In the end, his suffering was well beyond what it would have been if he had chosen the other path. He missed all that Christ had to give. Today, I see people trying to avoid earthly suffering, and picking evil over suffering. Picking sin over pain. Therese understood, pain is part of this world. Many allow themselves or friends to descend into an abyss of sin, without even the slightest notion that our job for ourselves and toward others is always point the way to heaven. We should always be pointing others to Christ, and this means loving people, but also calling sin, sin. It is a mistake to think that the only people Christ came to change were the hard hearted Pharisees, though he absolutely wanted them to change the legalism that lacked love, but he also came to change the suffering sinner. He embraced them with mercy and love and showed them Truth. That there is a better way to live. The tax collector, the Samaritan woman, the adulterous woman, they were changed. Christ showed them mercy, love, and truth. I dare say he showed them their own soul and they believed and they had humility and they changed, no longer justifying sin. Christ fully took on their pain and our pain. St. Therese also shows us that suffering is not the worst thing that can happen to you. She saw sin as the worst thing you can do. She knew there is a larger purpose to life. The life with Christ is the larger purpose for all of us. But today, we make laws that supposedly lessen suffering, and choose evil to lessen the suffering. We have asked God to leave, only taking that morsel of His teaching and rejecting the rest. Radical Love does not tolerate sin, but compels the sinner to change. It lovingly calls the sinner to repentance, to self -examination, to empty oneself, and let God take over. It accepts pain and sacrifice as part of this world. I leave you with a song linked below, I heard the day after reading the passage from St. Therese and I ask you, are you willing to give God all of you? I know Matt Hammit wrote the song for his son, who had a congenital heart defect, but for me in the moment listening to it, I wanted to give all of me to God which means giving all in love for others. This entry was posted in Uncategorized and tagged Catholic, Evil, Jesus Christ, Judas, Sin. Bookmark the permalink. amazing…..before i read this i realized that mankind is constantly taking the easy way out. Looking for the easy way…..it is natural to our flesh…..we all do it to more or less degrees. Then i read this article……..fantastic and thank you. Thank you Anne and God Bless. I am still trying each day to give God all of me. I was lead to your site by our friend Charlie. He has a wonderful sense for good people. The dichotomy of Judas and the Little Flower is brilliant. I have only recently begun to read her Little Way. I would like to be little someday. Thank you. St. Therese is a great example for all of us. She teaches me to hand over all to God.